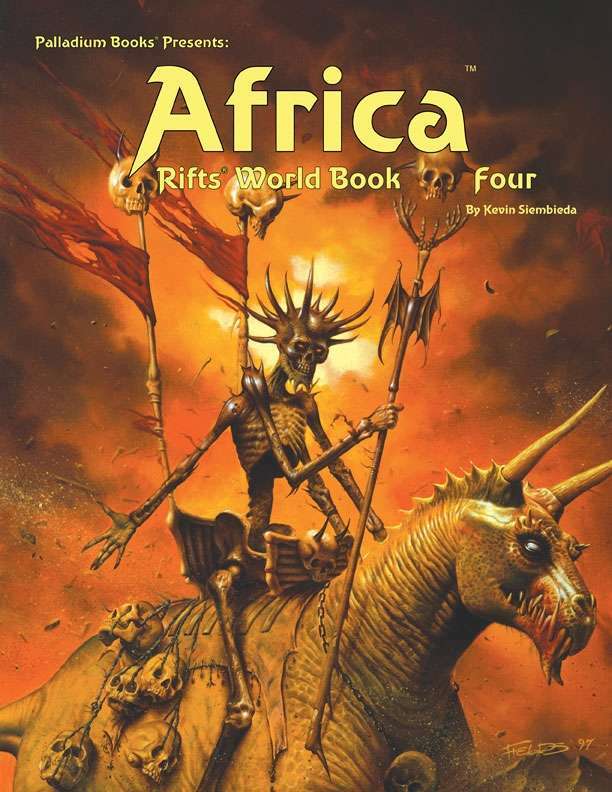 Rifts® Africa outlines key types of magic, places, people, customs, and societies of Africa. Plus the demonic Four Horsemen of the Apocalypse who threaten to destroy all life on Earth. Once life has been obliterated on Earth, the monsters will use the dimensional Rifts to carry their destruction throughout the Megaverse®. If they can be defeated one at a time, the Earth and the entire Megaverse may be spared. Failure means oblivion for all. The Four Horsemen of the Apocalypse! Nine O.C.C.s and R.C.C.s, including the Medicine Man and Rain Maker. The Mind Bleeder psychic class and 15 new Mind Bleeder psionics. Necromancy and the Necromancer O.C.C. Character stats for Erin Tarn and Victor Lazlo. Egyptian Gods, their minions, and magic. The Phoenix Empire, its monsters, slaves, weapons, vehicles and relationship with Atlantis. Pharaoh Rama-Set, an ancient dragon who rules as a god. More Splugorth weapons and technology. Profiles for Erin Tarn, Victor Lazlo and other famous NPCs. Note: Except for the cover, this edition is identical to the Kevin Long Cover edition. This title was added to our catalog on July 23, 2015.